(Medical Xpress)—A team of researchers from China and Japan has found that BHPF, a replacement chemical for BPA in plastics, can also cause estrogen-related problems in mice. In their paper published in the journal Nature Communications, the group describes tests they conducted on the impact the compound had on yeast cells and pregnant mice, the likelihood of it being released from plastic products and the prevalence of it in the blood of random college students. Over the past several years, a compound called Bisphenol A, or BPA, (used to soften plastics) has been in the headlines as researchers have found that it may cause hormonal problems in mice and people because it can behave in ways similar to oestrogen, resulting in abnormal reproductive systems. Because of that, many countries banned the compound, and in countries where it was not banned, such as the U.S., the bad publicly led plastics makers to find suitable replacements. One such replacement is BHPF, but now, it appears it may cause hormone problems as well. To learn more about the compound, the researchers exposed yeast cells to it because they are known to behave in ways similar to estrogen components. They found that rather than stimulating the cells, as BPA did, BHPF blocked such cells from binding with others in normal ways. The team then exposed pregnant mice to various doses of the compound and found that at certain levels, it led to multiple pregnancy problems including smaller litters. The group then tested water bottles to see if they released the compound by filling them with hot water and then testing the water to see if BHPF was present. They found BHPF in 23 out of 52 samples, which included three types of baby bottles. The team also collected blood samples from 100 random college students who reported drinking from water bottles—they found some amount of BHPF in seven of them, though they acknowledge there was no direct evidence of the compound coming from the drinking bottles. The researchers note that there is still no clear evidence that BHPF causes harm to humans or, if it does, how much of it people would have to consume before it became apparent. But they believe that toxicity of compounds used in food containers should be better tested before they are put into production. 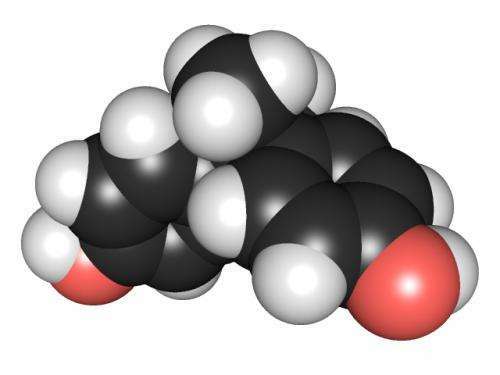 Bisphenol A (BPA) is used in the production of plastic but has oestrogenic activity. Therefore, BPA substitutes, such as fluorene-9-bisphenol (BHPF), have been introduced for the production of so-called 'BPA-free' plastics. Here we show that BHPF is released from commercial 'BPA-free' plastic bottles into drinking water and has anti-oestrogenic effects in mice. We demonstrate that BHPF has anti-oestrogenic activity in vitro and, in an uterotrophic assay in mice, induces low uterine weight, atrophic endometria and causes adverse pregnancy outcomes, even at doses lower than those of BPA for which no observed adverse effect have been reported. Female mice given water containing BHPF released from plastic bottles, have detectable levels of BHPF in serum, low uterine weights and show decreased expressions of oestrogen-responsive genes. We also detect BHPF in the plasma of 7/100 individuals, who regularly drink water from plastic bottles. Our data suggest that BPA substitutes should be tested for anti-oestrogenic activity and call for further study of the toxicological effects of BHPF on human health.